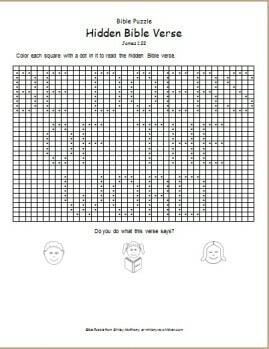 Color squares in a grid to discover the hidden Bible verse – “Be doers of the word” from James 1:22. Related: This activity sheet would be a nice addition to our Bible lesson from James 1. Our lesson on the Word of God is also popular with other readers. Don’t miss our whole series of coloring sheets based on Bible Stories for children. What command from scripture do you personally find difficult to obey? What can parents and teachers do to encourage kids to follow through on what they learn from God’s Word?